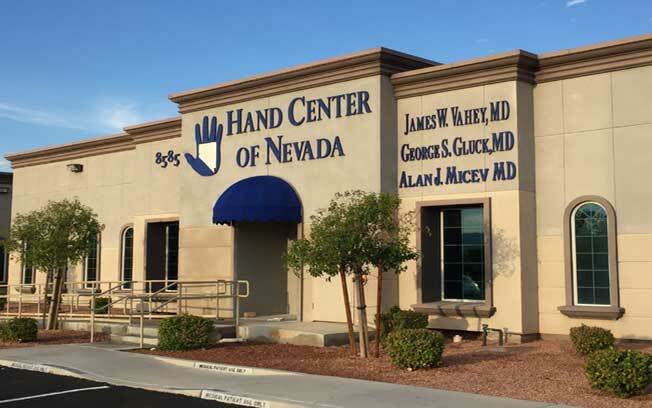 At the Hand Center of Nevada, we understand you are coming to us for help. When your hands or arms are causing pain and limiting your function and enjoyment of life, our commitment to supporting your recovery can help to ease your mind in times of stress and discomfort. Furthermore, our comprehensive range of advanced treatment options for the hand, wrist, elbow, and shoulder is designed to provide pain relief and healing as quickly and as safely as possible. Dr. George Gluck, Dr. James Vahey, and Dr. Alan Micev, our extensively trained orthopaedic surgeons, are knowledgeable in both surgical and non-surgical modalities, and they will utilize conservative and minimally invasive methods first, advancing to more aggressive techniques as your condition necessitates. In many cases, surgery will not be required, and we will customize a treatment plan that respects your unique anatomical needs and expressed preferences in an effort to achieve optimal results. Our philosophy of exceptional patient care begins here. We have provided a selection of the following online resources to help you find the information you need from home or when on the go. To learn more about our practice and what we can do for you, please follow the links below. If you have additional questions or would like to schedule a consultation with one of our board-certified specialists, please contact our office today.